Freshens, one of the nation’s largest college and university retail brands, is proud to announce the opening of two new locations at Valparaiso University and the University of Akron. Valparaiso, a private university located 90 miles southeast of Chicago, celebrated its Freshens’ Grand Opening in the Campus Café on August 26. Students have been lining up to enjoy handcrafted crepes, fresh made salads, smoothies and frozen yogurt. “Freshens has been a big hit and well received by the campus community here at Valparaiso University” stated Anthony Coschignano, Director of Dining Services. “We have more than doubled sales with the new stylish look and great tasting products. This program offers a unique offering that is fresh and healthy and has an option for all to choose from and another great part is that our students have found this program to be a great late night option for them. The Freshens team is great to work with and they provide support throughout the entire process. They have found niche that is going to be a big hit as it catches on”, said Coschignano. The University of Akron celebrated the opening of Freshens alongside Zee’s Natural, an upscale convenience store with an emphasis on better for you prepared foods, fresh fruit and healthy snacks. 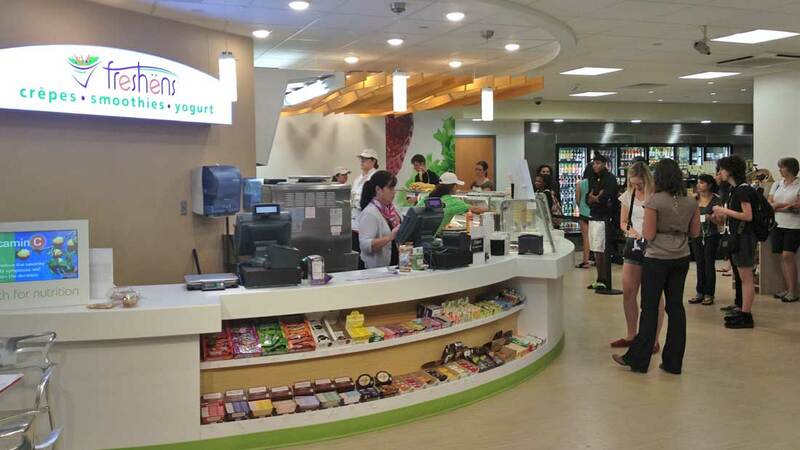 Students can complement their Zee’s purchase with Freshens crepes, smoothies and yogurt, which align with the university’s goal of offering healthy options to students and faculty. According to Gary Goldberg, Director of Dining Services at the University of Akron, “the transformation of the Zee’s C-Store in the Student Union has been met with great success and great feedback. As we had hoped, our traditional customers are either enjoying the new store or heading to our other stores for their favorite snacks” noted Goldberg. “The addition of Freshens was to be complementary to our Zee’s Natural Store but, in actuality is driving 70% of the business. We are very pleased with the food & beverage quality and the support being provided by Freshens”. Freshens is also proud to announce new store openings at Scott & White Healthcare-College Station, Texas and Webster University, St. Louis, MO. Also, store remodels at The University of Michigan and The University of North Carolina at Chapel Hill and on target to open later this month at Kennesaw State University, Kennesaw, Georgia, as well as Duquesne University in Pittsburgh, PA.
Over 20 new Freshens are set for 2014 Spring College Campus openings. Freshëns is the largest yogurt and smoothie company in the country and has been in operation for over 25 years. Freshëns is a privately held corporation headquartered in Atlanta and is focused on innovative, healthful products for consumers looking for convenient, portable and great tasting options. By adapting to industry trends and ever-changing customer needs, Freshëns is poised for continued growth. For more information, go to www.Freshens.com or like us at www.facebook.com/Freshens.